Purse, handbag, satchel, luggage or sack— they are basically containers to carry loose things around. As a sculptural object, there are just a few requirements, including storage space, durability and ease of use. I don’t understand the craze over designer bags. From what I’ve seen, most aren’t very interesting and are kind of ugly. Clearly, the fashion world is a mystery! This first purse is being clutched by a wrench hand in my found object piece, Walking the Dog, which can be seen here. 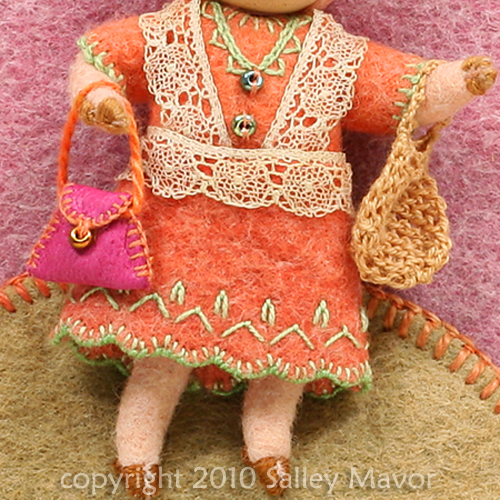 This little piggie going to market is from Pocketful of Posies. The string bag is made with a needle crochet technique that I figured out on my own. I’m not patient enough to follow directions to learn the proper way to crochet with a hook, so I just fool around with a needle and thread. Here’s an old man clothed all in leather, from the illustration for the folk song “One Misty Moisty Morning”. This and all of the next closeups are from Pocketful of Posies. The photos are blown up to about twice their actual size. 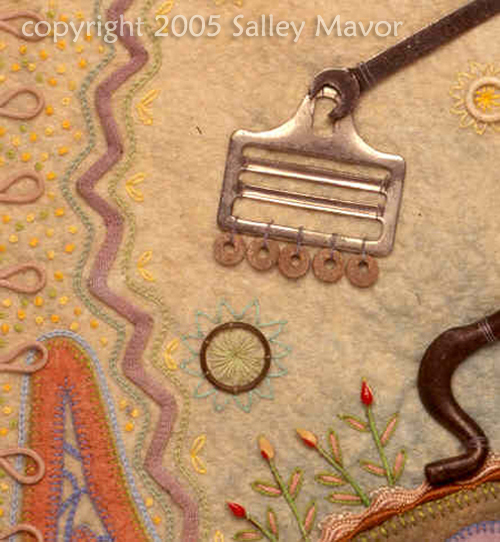 This entry was posted in Children's Books, Closeups, Fabric Relief, Felt, Found Objects by Salley Mavor. Bookmark the permalink. It is so much fun to see all the details. 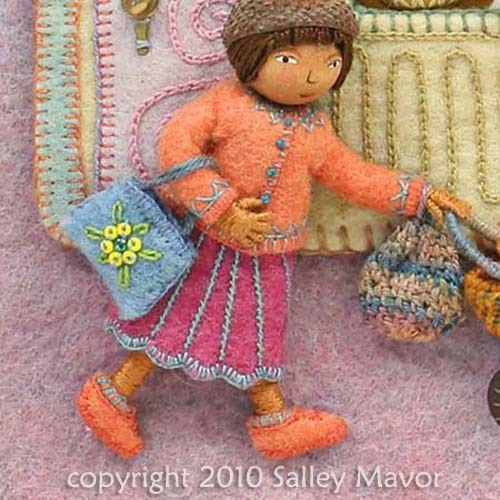 You are so very inspiring….the hair, the flowers, the bags, the colors! I love the close-ups. 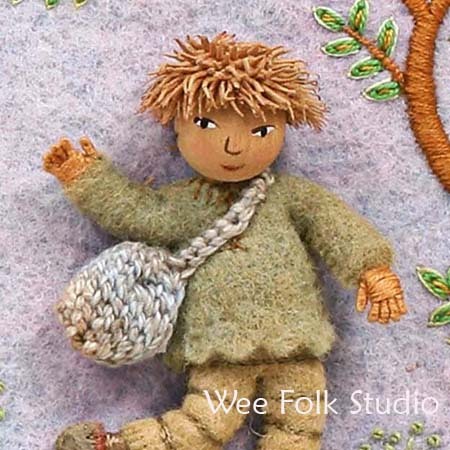 The bags are wonderful and so are all the other little details! Absolutely marvelous! Enormously well done! And this, of course, goes for all your work! Lovely little bags, and I totally agree about the bags that seem to be in fashion right now, definitely not my taste! My gosh the hair on that boy I cannot imagine how you made that. 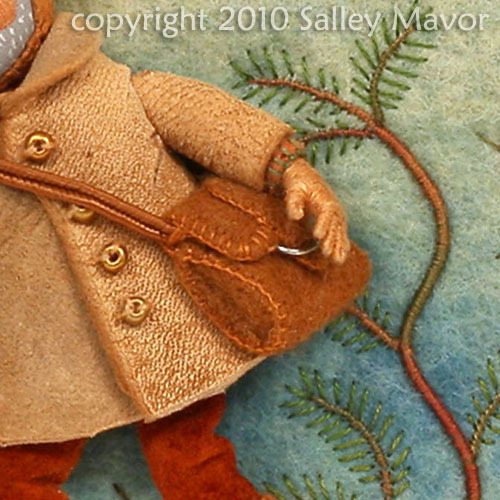 Salley you a just so amazing with your creative genus I am awestruck. My book is on the way from Amazon.